A father whose son was killed when he was shot in the head has pleaded with police to do more to catch those responsible. The remains of Mark Corley, 23, from Grantham in Lincolnshire, were found on remote farmland near Darlington, County Durham, in December 2000. The case against five men charged with murder was dropped when it emerged police had illegally recorded evidence. Lincolnshire Police said it would look at the case if new evidence was found. 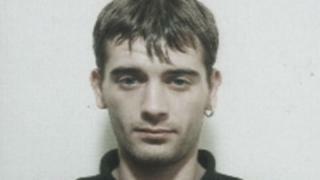 A trial at Nottingham Crown Court in January 2002, heard Mark Corley had been "executed by a brutal shooting". However, Mr Justice Newman discharged the defendants after it emerged their privileged conversations with solicitors were recorded in the exercise yards at Sleaford and Grantham police stations. The judge said: "Flagrant breaches of the law occurred." Mr Corley's father Tony, who lives in Nottinghamshire, said: "I feel very bitter, very angry - It has just destroyed my whole life, really." He said he would not rest until his son's killers were behind bars. "I just want the people responsible brought to court - people should never get away with murder." "Surely they [Lincolnshire Police] would want to do their job right and bring these nasty people to court and get justice," he added. "We can then try and move on." Deputy Chief Constable Craig Naylor, of Lincolnshire Police, said: "Whilst nobody has been brought to justice for the murder of Mark Corley, we do hold reviews of the case periodically in line with force policy. "Should additional evidence or information be forthcoming, discussions will be held with the family and the Crown Prosecution Service and every effort will be made to progress the case."